Who doesn’t love food made with fresh ingredients? I know I do. 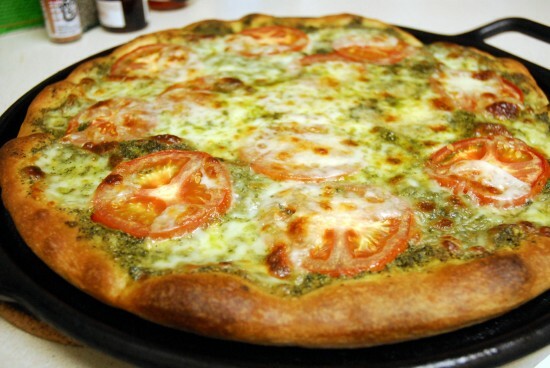 This recipe for pizza is awesome because it uses fresh vegetables and cheese. You can either use a pre-made pizza dough or you can make your own. I am a big fan of my pizza dough recipe. All you need is a bread machine and 1.5 hours. I usually put on the dough about 2 hours before dinner. You will notice that the sauce for this pizza is freshly ground pesto made from kale, garlic, basil, walnuts, and parmesan cheese. I cannot wait to try it! I usually make pizza once a week so this is going to be a meal for my family in the next couple of days. This recipe can be found at After Dinner Dance. She has an amazing website full of healthy recipes! I am sure if you browsed around, you will find many more yummy recipes to try! If you want to make your own pizza dough and own a bread machine, check out my recipe for Easiest Bread Machine Pizza Dough.